Undoubtedly recognized as a UNESCO World Heritage site, the Ellora caves and the Elephanta Caves, India are situated close to the old village of Ellora in the Maharashtra State. Built between the 6th and 10th centuries, the caves are dedicated to the Buddhist, Hindu, and Jain temples with wonderful carvings and sculptures. Its name and fame has entitled the caves as the No. 1 frequently visited ancient monument in the nation. 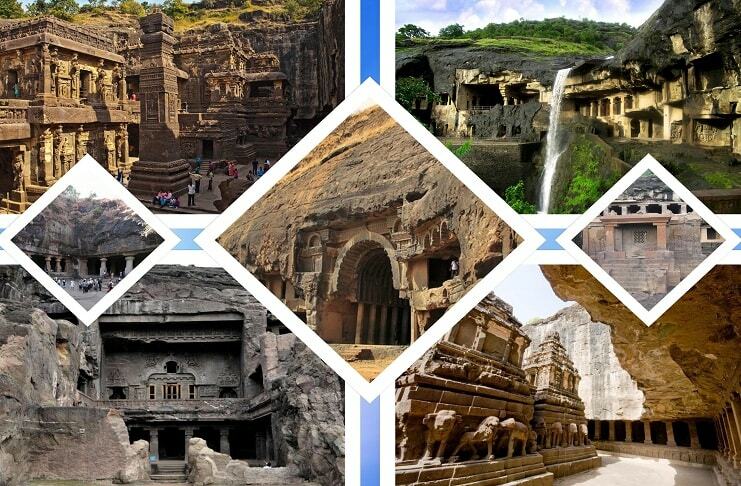 The 34 impressive caves include 12 Buddhist caves of 500-750 AD, 17 Hindu caves of 600-870 AD, and 5 Jain caves of 800-1000 AD. You can identify the caves with their chronological numbers starting from the oldest Buddhist caves in the south. I first started with the 17 Buddhist Caves, also known as the Vishvakarma caves, which are all monasteries utilized for study, meditation, and rituals. Among the Buddhist architecture of the Ellora caves, India, the Cave labeled 10 is not a monastery. Cave 1 is quite simple holding eight monastic cells that might have been a granary, while Cave 2 is comparatively more stunning whose doorway is holding a strong Padmapani with a lotus and adorned future Buddha – Maitreya. Within, a huge middle chamber with 12 square pillars is decorated with seated Buddhas and a shrine holds a seated Buddha on a lion throne. Cave 3 and 4 resemble this cave, but are not well maintained. Cave 5, the Maharwada Cave, is so named as the local Mahar tribe used to stay here in the monsoons. There is a majestic assembly hall that might have been a dining hall due to the presence of the dual rows of carved benches. The Buddha is seen on a stool where in his right hand is touching the ground via the Earth Witness gesture. Cave 6 is where you can see two superb sculptures of the cave complex. In the left, the sculpture of the goddess Tara with a deep, kind look is carved, while to here opposite is Mahamayuri, the goddess of learning with the peacock and an attentive student below. In Hinduism, she is Goddess Saraswati. The spectacular Cave 10, the Carpenter’s Cave, is so called due to its replica in stone of wooden beams on the top area. Check out for a seated Buddha in the facade of a large stone stupa. Next, Cave 11, the Dho Tal or Two Floors cave, defies its fact of being the three floor carving. The upper floor holds a long assembly with columns and houses a Buddha shrine along with sculpts of Goddess Durga and Shree Ganesh. This says that the cave was then a Hindu temple. Lastly, I visited Cave 12, the Tin Tal, housing a great upper hall, a shrine whose walls hold five large bodhisattvas and seven Buddhas – all revealing the former incarnations of the Enlightened One. Numbered 13 to 29, the Hindu caves are carved in a different style and occupy the surroundings of the popular Kailasa Temple in the complex of the Ellora caves India. Most of them are dedicated to Lord Shiva, but also have images of Lord Vishnu and his incarnations. The walls of these caves are decorated with beautiful bas-reliefs showing famous Hindu tales. The Cave 14 was previously a Buddhist monastery where the Goddess Yamuna and Ganga guard the doorway. The lengthy walls offer splendidly carved friezes, while a niche within houses seven fertility goddesses (the Sapta Matrikas) with fat babies on their laps. To the right, check out for the female form of Lord Ganesh and Kala and Kali – the ghastly goddesses of death. Cave 15 was also a Buddhist cave famous for the ideal sculpture on the top floor. Along the right wall, note the panels of five Vishnu’s incarnations (avatars) due to which the cave is called the Dashavatara. Look out for the panel wherein Lord Shiva rises from the Jyotirlinga and that Shree Brahma and Shree Vishnu attend with modesty. The most attractive sculpture is in the left wall – Lord Shiva as Nataraja, the Cosmic Dancer. Cave 16 is the most appreciated one, which is a great temple made from a solid rock. It showcases the residence of Lord Shiva – Mount Kailash due to which it is known as the Kailashnath, Kailash, or Kailasa Temple. Initially, a thick coat of white plaster was seen so that it appeared as a snowy mountain. The temple is double in size of the Parthenon in Athens with quite alluring spatial and architectural features that took 100 years of construction. Going down the hillside from here, other temples are carved, out of which 21, 25, and 29 are really beautiful. The most ancient Hindu cave is Cave 21, the Rameswaram, which offers superb sculptures – dual river goddesses and dual door guardians. Cave 25 is dedicated to the sun god Surya seen as driving his cosmic chariot. From here, you need go steeply down to reach a gorge and then up to Cave 29, the Dhumar Lena, holding a peculiar cross-shaped plan. While the steps are guarded by the lions, its walls are decorated with grand friezes. At the entrance’s left, Lord Shiva is shown killing the Andhaka demon and overcoming the Ravana’s effort to jolt him and his wife Parvati atop Mount Kailash. Look for a dwarf taunting the demon and how Lord Shiva taunts at Goddess Parvati by taking her arm back when she is about to throw the dice for a game. At the Ellora caves India, the Jain caves are seen two km down a tarmac road exhibiting the unique Jain philosophy and tradition with strict asceticism and great decoration. Several of them houses lavish paintings in the ceilings. Cave 32, the Indra Sabha (Indra’s Assembly Hall), a small replica of the Kailash Temple is the most magnificent. Two tirthankaras (apostles) are seen at the entrance. At the right is the Lord Gomateswara shown mediating intensely such that his legs are covered with vines and animals crawl around him. Note the ceiling with the detailed carvings of a fine lotus flower. Another prime cave destination here is the famous Bhaja Caves which is a magnificent group of 22 rock cut cave structures and is located 400 feet above the village of Bhaja.